Nestled in the Himalayan range of Uttarakhand in India, Kalap may soon have a motorable road. Till then the village continues to be 10 kilometers uphill on foot from the nearest road. The film delves into the lives of the people of Kalap, who for generations have been negotiating their own path for sustainable living. With increasingly easy access to the world beyond, will there be a gradual shift in social and cultural values across generations? 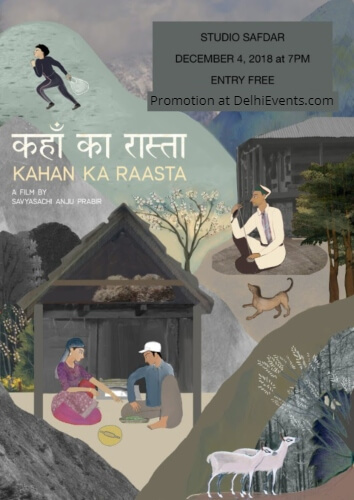 Kahan Ka Raasta is an immersive journey, in time and space, into the everyday reality of Kalap. It transpires at the pace of the village life, to unveil its many facets. Savyasachi Anju Prabir is a graduate in Film Studies from Srishti Institute of Art, Design and Technology, Bengaluru. His graduation film, Miilelam Miiyoh, evolved from over a month-long process of living and engaging with the Yimchunger community deep in the forests of Fakim in Nagaland. After completion of the Early Career Fellowship at School of Media and Cultural Studies, TISS, Mumbai he has enrolled at the University of Munster, Germany to pursue his Masters in Visual Anthropology.